A selection of high-profile guests and alumni of City University London attended a recent event at the White Tower at the Tower of London. The event saw Speaker of the House of Commons, the Right Honourable John Bercow MP, deliver a speech about the importance of Higher Education and Vice-Chancellor, Professor Sir Paul Curran provide an update on the progress of the University. Organised by the Development and Alumni Relations Office (DARO), the event enabled alumni (including some who had not been in contact for some time) to learn about the research being undertaken at the University and to meet Deans and senior representatives of the University’s five Schools. Before the speeches the guests, who included Honorary Graduate and BBC Newsreader Sophie Raworth, were offered a private viewing of the Crown Jewels on display at the Tower of London. 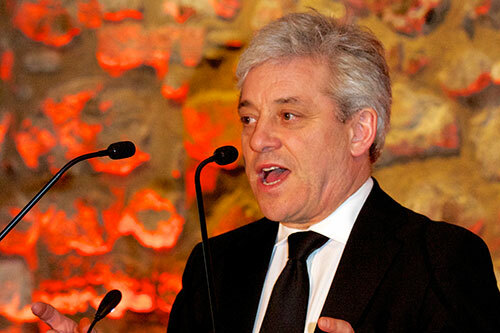 Guest speaker and Honorary Graduate of City, John Bercow MP, explained how his career developed from a humble background and emphasised the importance of universities in changing lives. He mentioned in particular some of the outstanding work undertaken at City in the area of Speech and Language, an area in which he is particularly active. It is an honour to welcome guests and alumni of the University and to share some of the great work City is doing to change lives. Our research is recognised worldwide for its quality and for the impact it is having on the wider economy, culture, public services and policy-making. We hope that our alumni will take great pride in the work we are doing. Professor Curran talked about the importance of the student experience and highlighted the recent investment in facilities such as CitySport and 200 Aldersgate, from where Cass delivers the Executive MBA and other Executive Education. He also discussed City’s research and the 2014 Research Excellence Framework (REF) exercise which confirmed City has doubled the proportion of its academics producing world-leading and internationally excellent research.